Developers of Unidata's Integrated Data Viewer (IDV) traveled to the University of Wisconsin, Madison's Space Science and Engineering Center (SSEC) in late November to meet with developers of SSEC's Man-computer Interactive Data Access System Fifth Generation (McIDAS-V) package. Three members of the Unidata Program Center staff attended the EarthCube charrette held in Washington D.C. on November 1-4, 2011. Read on for Development and Outreach Manager Ben Domenico's impressions. 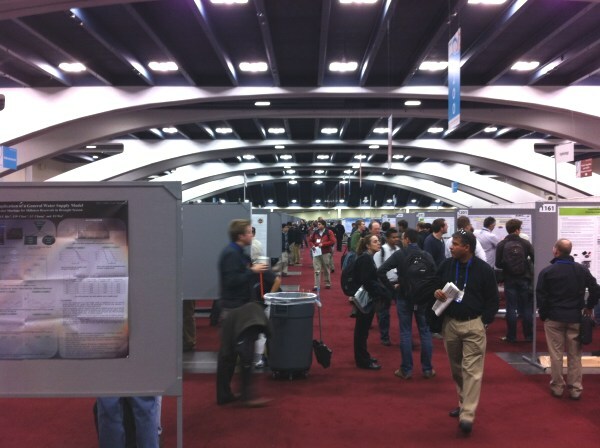 The American Geophysical Union's 2011 Fall Meeting in San Francisco has come to a close, but Unidata Program Center staff enjoyed meeting and talking with community members over the course of the weeklong event. Dr. Stefano Nativi of the Earth & Space Informatics laboratory (ESSI-lab), National Research Council of Italy - Institute of Atmospheric Pollution Research calls attention to the deadline for submission of abstracts to the forthcoming Earth and Space Sciences Informatics (ESSI) sessions of the European Geosciences Union (EGU) General Assembly in Vienna, 22-27 April 2012. The Unidata Program Center's Yuan Ho reprised the Visualization of Geoscience at the Speed of Thought demonstration he presented at the December 2011 American Geophysical Union meeting to a local NCAR audience on December 20, 2011. The Unidata Program Center is pleased to announce the opening of the 2012 Unidata Community Equipment Awards solicitation. For 2012, a total of $100,000 is available for awards; proposals for amounts up to $20,000 will be considered. GRIB and BUFR as Archival Data Formats? Unidata developer John Caron spends a big portion of his time thinking about how to make the formats in which scientific data are stored more useful and robust. If you're a user of the GRIB or BUFR formats, or just have an interest in the long-term viability of data formats in general, read on.